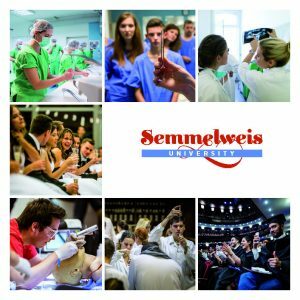 Semmelweis University pays dedicated attention to the recognition of talented students, their support and scientific education. Organised talent support programmes are realised in colleges for advanced studies and within the framework of the talent support programmes. The primary goal of the Students’ Scientific Association is to provide an opportunity for every student to get involved in research and to gain experience at Hungarian and international conferences. The Students’ Scientific Association is a platform for self-instruction and scholar training: talented students are aided by outstanding teachers and researchers to get an insight into scientific life during their studies. The programme enables students to build personal and professional relationships that prepare them for their scientific career. Currently there are around 1,200 students involved in the programme of the Students’ Scientific Association. Nearly all of the university’s departments and clinics take part in the talent support programme. The Kerpel-Fronius Talent Support Programme was set up by the Senate of the university in 2007 to find and continuously support exceptionally talented incoming, current and graduated students. Since 2017 the programme has been open to international students as well. The programme is run by the Talent Support Council with the help of the faculties’ representatives. Semmelweis University’s outstanding teachers and researchers volunteer to become mentors and are responsible for one exceptionally talented student’s academic advancement, support and application for scholarship. Enrolment in the programme is based on the student’s academic results and a personal interview, and successful applicants are offered individual mentoring and scholarship opportunities by the programme. The Jellinek Harry Scholarship is run by the Kerpel-Fronius programme which provides the opportunity for 6 students per year to study at the universities of Heidelberg and Freiburg. The Semmelweis Foundation sponsors 7 students per year for their outstanding scientific, cultural and public activities. The Korányi Frigyes College for Advanced Studies has been operating for 30 years and has become the cornerstone of Semmelweis University’s talent support network. Its training system has successfully integrated several initiatives and provides complementary training to Semmelweis University’s internationally recognised education in the field of natural sciences. Korányi Frigyes College for Advanced Studies is a professional workshop preparing students not only for patient care but it also gives an insight into education and research. Students interested in healing, science and the university education of doctors and pharmacists of future generations are expected to apply for the programme. The students of the college need to meet high professional requirements. Apart from active participation in the courses they have to have high academic results and are obliged to take part in the scientific work of the Students’ Scientific Association. Currently the college has 56 members. The college students live in a calm and comfortable dormitory. Bedrooms can accommodate 2 students who are provided with services necessary for studying (study-rooms, educational material, photocopier, skill lab and Internet) and relaxing (lounge, video room, gym). Besides professional events, several cultural and community events are organised.